By Costa Maragos Posted: August 31, 2015 6:00 a.m. Dogs can bring great comfort to people dealing with stress. Now research shows there are many therapeutic benefits to bringing therapy dogs to university campuses to help stressed-out students, particularly during final exam time. 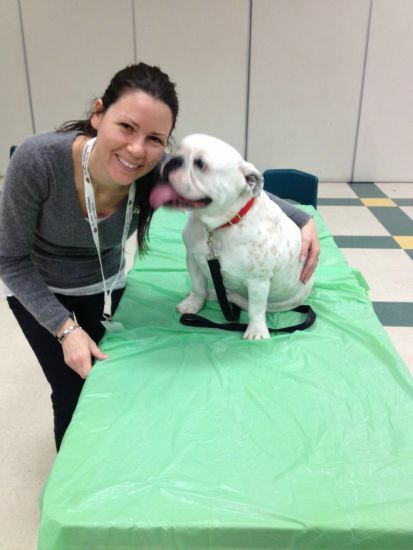 “We found that dogs offer students love and support. This is an important finding, given that student mental health is a serious concern on Canadian campuses,” says Dr. Darlene Chalmers, Assistant Professor in the Faculty of Social Work. Dr. Chalmers was part of a team that examined the benefits of therapy dogs for students. The research was a collaborative effort that included the U of R, the University of Saskatchewan and McMaster University in Hamilton, ON. Dr. Colleen Dell, a professor in the Department of Sociology and the School of Public Health at the University of Saskatchewan, was the lead researcher. The pilot study, titled “PAWSing student stress: A pilot evaluation study of the St. John Ambulance Therapy Dog program” sampled more than 400 students and 16 handlers/observers. The findings offer preliminary evidence that the St. John Ambulance Therapy Dog Program is achieving its goals of offering love and support to students. Therapy dogs have appeared at the U of R the past two years, thanks to the efforts of the Student Success Centre. The Centre will bring back the dogs, weekly for the Fall Semester, beginning September 15. “Although this study did not intend to measure stress, students reported that the impact of the program, and specifically their experiences of love and support with the dog, were helpful in their stress reduction,” says Dr. Dell. The research team followed up with dozens of students, three months after their puppy encounters. More studies on the impact of Therapy Dogs are coming. “Specifically, the implications for student mental health support on the university campus are numerous,” says Dr. Chalmers. Her research interests include the human-animal bond and veterinary social work. The full study will be released in the Canadian Journal of Counselling and Psychotherapy.